english - Produktionszentrum Tanz und Performance e. V.
Produktionszentrum Tanz + Performance is a non-profit, publicly funded membership association. It has been a hub for all dancers, choreographers and performers in the independent dance scene in and around Stuttgart for over a decade. Some 50 members from the fields of dance and dance education, performance, theatre and the visual arts use the production centre as a place of interdisciplinary exchange and collaboration. The production centre’s main focus is the support and promotion of up-and-coming independent choreographers and dancers. 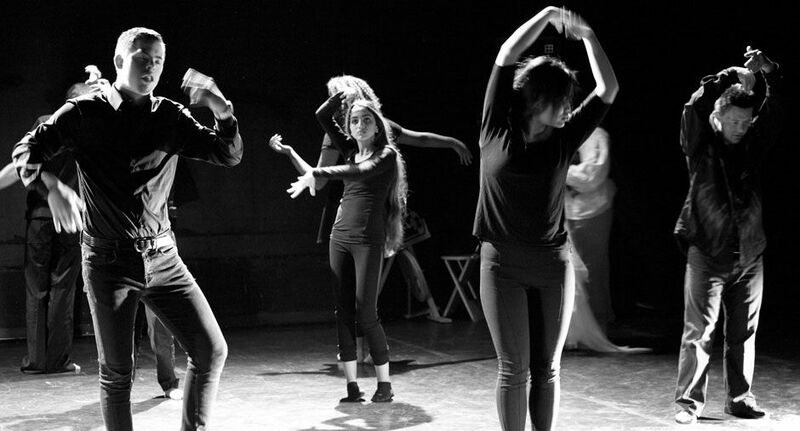 We feature a wide range of ongoing dance training for professionals on a regular basis and manage a rehearsal and performance space available for members' productions. We offer PR work for our members, and advocate the improvement of production and performance conditions for Stuttgart's independent dance and performance scene – thus hopefully helping to improve funding and production opportunities. Since 2010, Produktionszentrum has been campaigning intensively in collaboration with Freie Theater Stuttgart (Independent Theatres Stuttgart) for a shared venue for Stuttgart’s independent dance and fringe theatre scene. The production centre’s home is a converted beer hall in Stuttgart Feuerbach with offices, studio space, kitchen, foyer and communal areas. The rehearsal studio is a spacious historic ballroom from the 19th century. This is where our professional dance classes, workshops and seminars take place. It is also very busy with members needing rehearsal space. The studio is available for rent to non-members, please inquire at info@produktionszentrum.de. For our current class programme, please go to www.produktionszentrum.de or contact the office at info@produktionszentrum.de. Thank you for your interest in Produktionszentrum Tanz + Performance, a non-profit association dedicated to promote contemporary dance and performance art in Stuttgart. All dance, performance and choreography professionals as well as artists from related fields (music, visual arts, film, stage design, light design etc.) are welcome to become a member. We are pleased about every newcomer. Members must agree to attend the annual general assemblies. All members agree to provide a portrait photo and a short CV for the website. They are also obliged to put the Produktionszentrum logo on all advertising material for their productions, and to keep the office informed about performance schedules and statistical information. Membership admission is at the Board's discretion. You can find the application form and SEPA direct debit form in the download area. To apply for membership the forms must be signed and sent to the office. Head of the board is Dr Clara Napoli. All board members work on a voluntary basis. Clara Napoli is a lawyer specializing in legal services for the creative industries. Aleandra Mahnke is an experienced dancer, execise teacher and choreographer. The Advisory Board is committed to the cultural and political interests of the association. It advises the Chairpersons, promotes and supports co-operations with other cultural institution. It consists of municipal councillors, representatives from the local arts council and members of the association, as well as members of the public. The Advisory Board is represented by Hans Casel, Martina Casel, Marcela Herrera-Oleas, Susanne Kletzin, Johannes Milla, Catarina Mora, Jürgen Sauer, Andreas Winter and Monika Wüst. For up-to-the-minute listings of all independent dance and fringe theater productions, please go to www.freie-szene-unterwegs.de, the publicity platform of the independent dance and theatre scene. Produktionszentrum Tanz+Performance is funded by the Stuttgart arts council.